We’ve have been using Avion Metal Works for ornamental staircases and railings in our multi-million dollar homes for over 10 years. 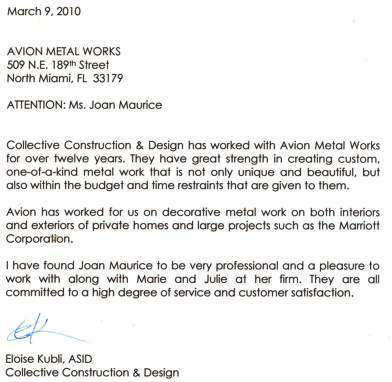 As a designer and decorator in Miami Beach for twenty years, I have been fortunate enough to have had Avion Metal Works as a viable resource for most of that period. I would have had them the full twenty years, but they weren’t around when I began my business. They are impeccable in their work and word, which today is a rarity. 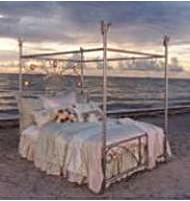 Avion has consistently manifested the concepts I have had for furniture, into reality and works of art. EVERY client has been thrilled with their metal furniture and I personally am lucky to have more than a dozen pieces of Avion Metal in my house, including the only illuminated jeweled bed in the world. Their work is timeless and borderless, as I have shipped their exquisite designs to clients around the world. My clients continually ask about the owners of Avion, as it has not only been a positive business relationship for them, but a warm friendly experience. I only wish Avion produced wood furniture, then I wouldn’t have to color my grey hair. As a builder and developer of numerous high-end homes and communities in the South Palm Beach County area over the past eighteen years, I have worked with few contractors as reliable, capable, and easy to work with as Avion Metal Works. Aside from the outstanding quality for their finished prod-uct, the courtesy and professional manner afforded my staff and valued customers by Avion is unique to the industry. I would highly recommend Avion Metal Works toanyone looking for that cut above experience. Choosing a railing company that can change iron into art is a challenging task. Avion Metal Works led by Joan Maurice not only accepts this challenge but has` the formula for making the entire experience a joy. Joan & company possess the knowledge, skill and desire (emphasis on desire) to deliver only the finest crafted railings, doors & gates. If you are looking for a company which has high standards you have found them! Avion Metal Works, Joan Maurice and her entire staff have been a true pleasure to work with since our relationship was forged. Her creativity in design and their ability to produce the highest quality pro-duct on time and on budget provides an apprecia-ted comfort level from our prospective. Knowing that our clients will be equally thrilled with the ex-perience and the product only strengthens our confidence in a job well done. We have found Joan to be extremely knowledge-able as well as delightfully creative. If it can be designed, Avion Metal Works can put all the pieces together. When the end product is delivered for installation, Joan and staff will be on site. How could one ask for more!? It IS SOOOOO “FRICKIN” CUTE!!!!!!!!!! see now we’re going to start you in a new direction with door handles!!!!! This will be your new signature!!! I Love it!!! Thank You!!!!!!!!!!!!!!!!!!!!! Joan, Julie and their staff at Avion Metal Works (or just AMW) created a spectacular stair railing for our residence, which truly became the focus of our home. We have been receiving compliments since the day it was installed! We have also hired them to work on other projects over the past 12 years and they have always delighted us with their attention to detail, quality work and eagerness to please. Their talent, dedication and loyalty is undeniable and has made all our projects with them enjoyable and exciting to watch from start to completion. They are easy to work with and I can assure you will love their work. Avion Metal Works will go to great lengths to achieve the expectations of their clients.